A simple and flavorful yogurt based curry that will keep you cool this summer. 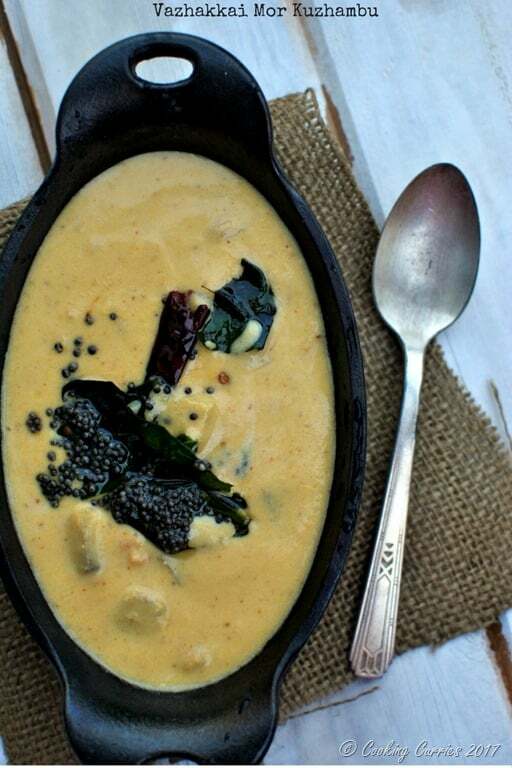 This Vazhakkai Mor Kuzhambu is a perfect curry to go with plain steamed rice. It had been a while since I bought veggies from the Indian store, so when I went to the Indian store last Friday, I picked up some raw green bananas and okra. The okras were made into some really tasty stuffed okra along with some garlic dal for Monday night dinner. The spices that were roasted and ground with the coconut, reminded me of a particular ground coconut sauce based curry that amma and paatti make. 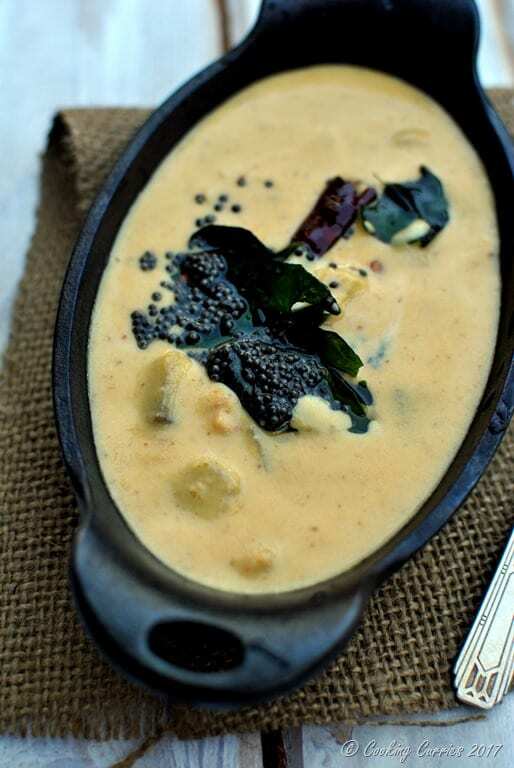 It was called Thengai Aracha Kuzhambu, simply translated curry with ground coconut. Simple, isnt it? 🙂 That is another reason why I was attracted to this recipe. Chandra Padmanabhan’s recipe asked for coconut milk also to be added to this and I did not want to make it any more complicated and rich. There was already ground coconut in this recipe along with yogurt and I decided to keep it to just that and skip the coconut milk part altogether. Bring about 2-3 cups of water to a boil in a medium sized pan and add the plantain cubes to it along with the turmeric powder. Let it cook. Meanwhile, heat the oil in another pan. 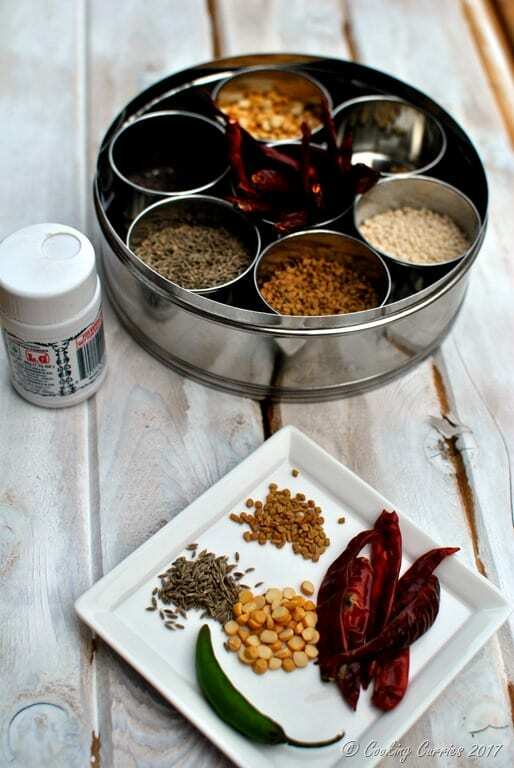 Add the fenugreek seeds, dried red chillies, chana dal and asafoetida to it. Once the fenugreek seeds and chana dal turn color, turn off the heat. Do not let the fenugreek seeds burn as they turn pretty nastily bitter. Once off the heat, add the cumin seeds, green chilli and rice flour. Add this to the coconut and grind to a smooth paste with a little water (2-3 tbsp) in a food processor or chutney jar of a mixer grinder. 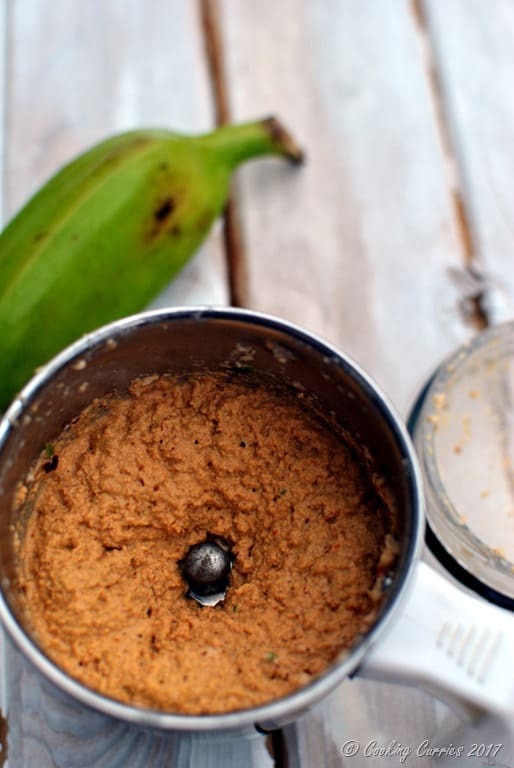 Check if the plantains are cooked well. If they are, then add the ground coconut mix to it and let it come to a boil once again. This takes care of any raw spice smell / taste that may be there in the ground mix. Add some salt to the mix. Switch off the heat and add the yogurt to this. The reason why we add yogurt after switch off the heat is to make sure it does not curdle. In a separate pan, heat oil for the tempering. Add the mustard seeds, once they splutter, add the chillies and curry leaves. Pour this over the plantain-yogurt curry. Serve hot with rice and any vegetable side. Bring about 2-3 cups of water to a boil in a medium sized pan and add the banana / plantain cubes to it along with the turmeric powder. Let it cook. Thank you Sujata ?? it definitely is finger licking good!